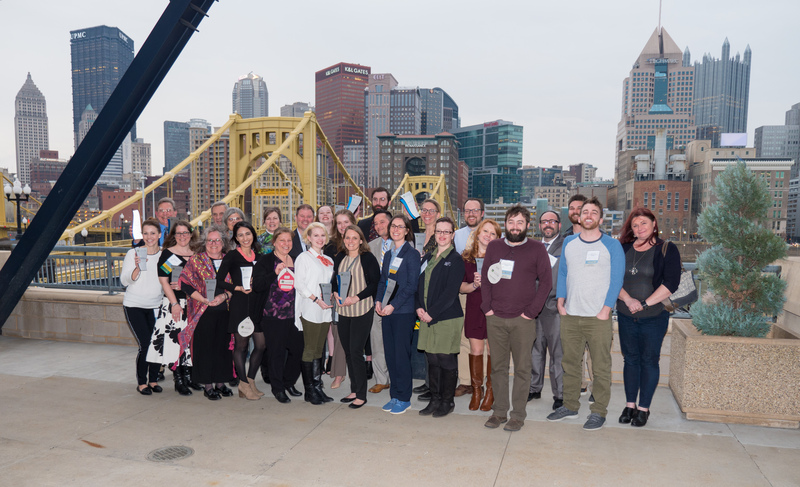 (PITTSBURGH, PA – March 21, 2019) This evening Sustainable Pittsburgh revealed the winners of the 2018-2019 Sustainable Pittsburgh (SP) Challenge during a celebration at PNC Park on the North Shore. A 13-month friendly competition, the SP Challenge enables businesses, nonprofits, municipalities, universities, and K-12 schools to track sustainability performance and receive positive recognition for their achievements. More than 100 employers from throughout southwestern Pennsylvania demonstrated their commitments to sustainability and completed the competition. Combined, these organizations took 2,209 sustainable actions, each of which earned them points in the challenge. Examples of actions include: reducing energy and water usage, monitoring indoor air quality, implementing policies on supplier diversity and supplier code of conduct, creating a workplace sustainability team, and encouraging carpooling and other alternative forms of transportation. The actions fall within seven sustainability focus areas: Air Quality, Materials Management, Social Equity, Engagement, Energy, Water, and Transportation. Among this year’s achievements is the collective energy savings achieved. Energy usage includes more than just electricity; it also includes natural gas and district steam. The aggregated savings by this year’s participants are enough to power a whopping 7,978 average Pittsburgh single-family homes for one year. This translates to more than 80 million kWh of energy and $6,274,423 in cost savings! Participants also saved enough water to fill more than 30 Olympic-size swimming pools—or PNC Park to a depth of 28.1 feet (as high as a three-story building)! Water savings totaled more than 20 million gallons. Based on pre and post transportation surveys, participating organizations also avoided an average of 200 pounds of carbon dioxide emissions annually, per person. Sustainable Pittsburgh also hosted an abbreviated, 18-week challenge for K-12 Schools, designed specifically for teachers and students to easily participate in sustainability actions. This is different from the K-12 Schools category for the 13-month competition listed above. The winner of the K-12 School Classroom Challenge is Central Catholic High School. “More than 300 unique organizations have participated in the Challenge since 2011,” said Autumn Secrest, Sustainable Business Program Manager for Sustainable Pittsburgh. “Their participation has shaped the program as much as the program has shaped their work. For every Challenge, organizations bring innovative ideas and solutions that we later incorporate into the program. Sustainable Pittsburgh also presented Top Energy Saver, Top Water Saver, and Top Waste Saver Awards. The Top Energy Saver Award is presented to the organization that achieved the highest percentage of measured reduction in workspace energy consumption from this competition year compared to the prior year, as measured using the US EPA’s Energy Star Portfolio Manager. Sustainable Pittsburgh presented the Borough of Etna with the Top Energy Saver Award. Etna reduced energy usage by an impressive 25% over the course of the year. Similarly, the Top Water Saver Award is presented to the organization that achieved the highest percentage of measured reduction in workspace water consumption from this competition year compared to the prior year, also measured using EPA’s Energy Star Portfolio Manager. Conservation Consultants, Inc. received the Top Water Saver Award, having reduced water usage 31%. Sustainable Pittsburgh announced Transportation Impact Saver: Pashek + MTR, which reduced average weekly commuter emissions by 73.72%. They achieved this remarkable reduction by leveraging a work-from-home policy. The inaugural People’s Choice Award recognizes one organization for its innovative or inspiring sustainability solutions, initiatives, or actions. Each organization that participated in the SP Challenge was eligible to cast a vote for their nominee of choice. Of the four nominees — Allegheny County, Allegheny County Airport Authority, Borough of Etna, and Greater Pittsburgh Community Food Bank — the Borough of Etna won the People’s Choice Award with 46% of the votes. All winners received special awards made from Rivanna Natural Designs, a certified B Corp offering planet-friendly alternatives to traditional trophies and plaques. The Sustainable Pittsburgh Challenge is an initiative of Sustainable Pittsburgh’s Champions for Sustainability business network. The Pittsburgh Business Times and NEXTpittsburgh are Media Sponsors. More information is available at spchallenge.org or by contacting Autumn Secrest at asecrest@sustainablepittsburgh.org.